Reiki training is taught in a self-paced, online environment and I offer individual mentoring and coaching throughout. 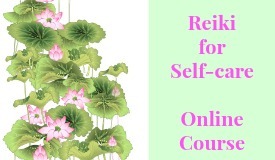 Reiki Level I is an excellent exploration for self-awareness and self-care. I like to think of Self-Reiki as a way to self-acceptance. This is a gentle, non-invasive way to engage in self-care. I developed a Reiki course for people who may be interested in learning the basics of Reiki. And I have created the course so that it is affordable for everyone. Why? Because I believe Reiki is an awesome way to practice daily self-care and mindfulness. As a psychotherapist and coach I was always searching for “tools” I could hand my clients – meditation, visualization, self-help books and workbooks, soothing music, expressive art- but I never realized that Reiki was another very real self-care tool I could have been passing along to my clients. In fact, had I known what I know now, I would have received Reiki training years ago to Master Teacher level so that I could teach my clients Reiki Level I. I believe self-administered Reiki maintains mental health and wellness. Reiki Level I training is offered by me and is for anyone who wants to learn how to self-administer Reiki and give Reiki to family and friends. The course is taught online and is modestly priced at $65.00. You can find a free course online too. The difference is the interaction and feedback you receive from me in response to short, written course assignments. 30-day self-Reiki is required as well as case studies. Experiential written assignments follow each lesson. Reiki I is the first step and teaches self-reiki as well as the initial training and attunement required to give Reiki to others. This course is offered as one option. This is the perfect option if you want to learn about Reiki and begin a wonderful journey of self care and personal awakening. Reiki I offers a solid foundation in Reiki tradition and history. It is my hope that you will continue with your training to Master Teacher level . I believe Reiki training and attunement that occurs online is just as valid and valuable as in-person training. This belief is not shared by all so if you are seeking Reiki training to be able to practice in-person or in a hospital setting, please be sure that this training will meet your needs. In the U.S,, Reiki is not regulated but hospital settings may ask for proof of in-person training. Private practitioners may receive training and attunement online or in-person. In the UK the Reiki Council determines the training criteria and online training and attunement is not accepted for hospital or other healthcare Reiki practitioner positions.